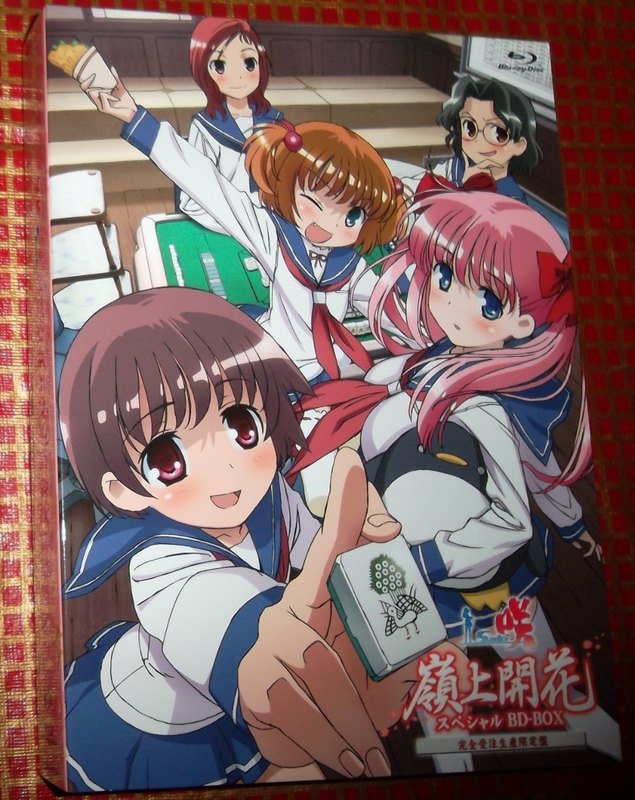 Earlier this afternoon, Skorp and I had an interesting conversation about the talents of the Kiyosumi mahjong team in Saki (original series) and I thought it would be a nice post to expand on. While this has some spoilers for the original series, I’m only going to focus upon the play style of each of the Kiyosumi team. After we see more of the Achiga team, I should have an accompanying post for them. (TL note: the kanji for Kiyosumi can be read as “serene”, thus the title) When commenting please DO NOT POST SPOILERS FOR THE MANGA OR ACHIGA SERIES! 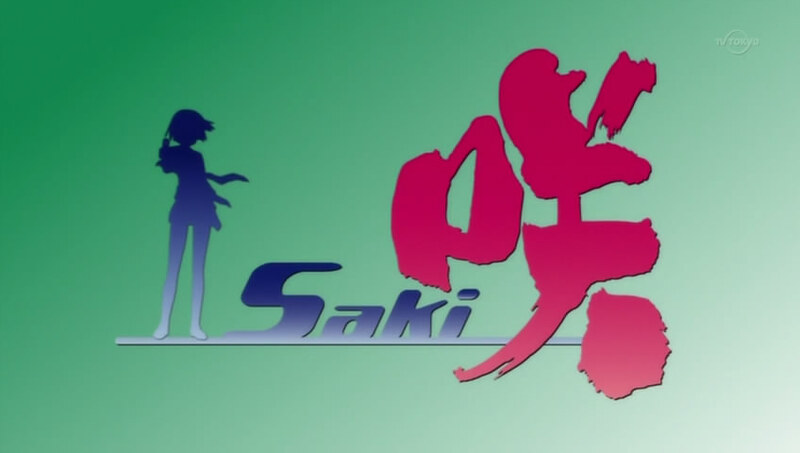 Aired in 2009, Saki was a show that breathed a lot of fun into the anime atmosphere. Going up against the K-On! monster, the show managed to sell just under 10k DVDs per volume. Unfortunately, the behind-the-scenes matters were not as fun. Gonzo ran into bankruptcy during the show’s airing and another studio had to take over animation. 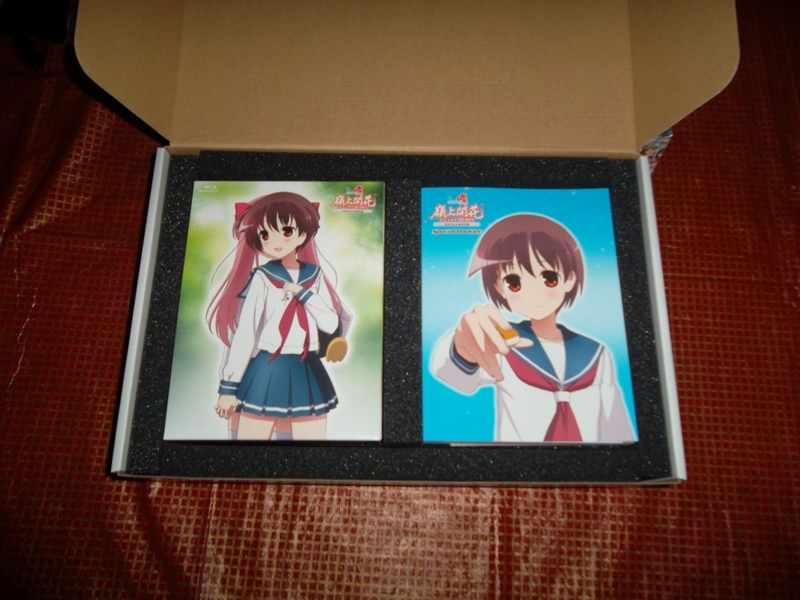 The final product was still one of my favorite shows and I planned to save for this box as soon as we heard news of a “big announcement.” Here is the GIANT Saki Blu-ray box. So yes, it’s huge, but how huge? 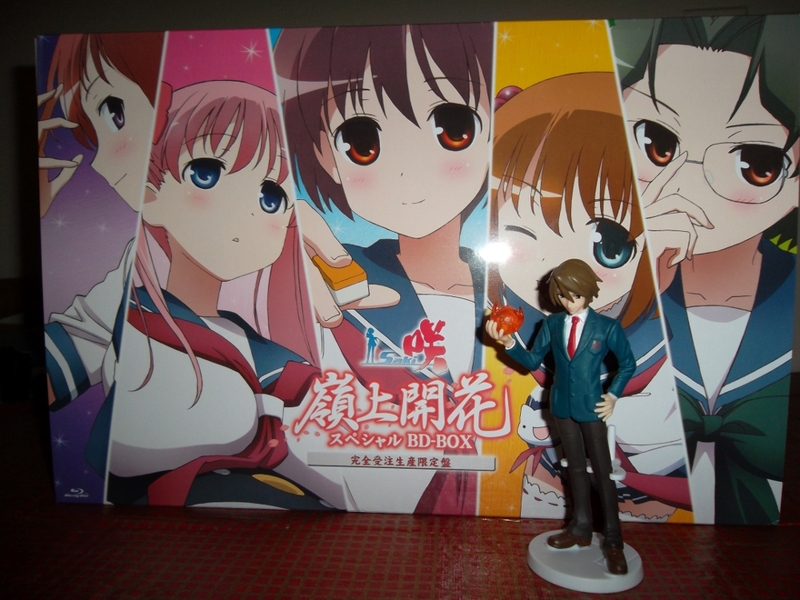 Here’s three comparison photos with a figure, DVD, CD, Blu-ray, and light novel. 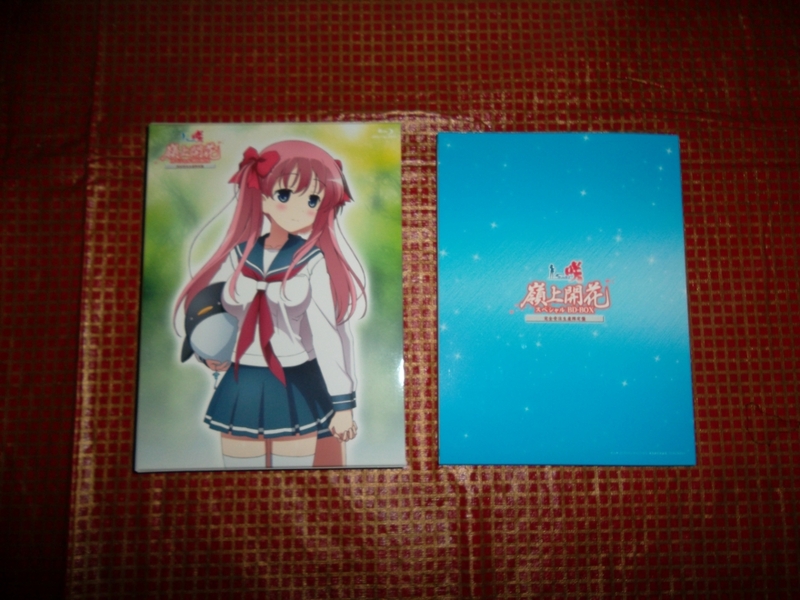 We have the BD case on the left, and the booklet, 3D cards, and event lottery ticket on the right. There’s also some artwork on the back of the case. Inside the case is a three-sided digipack with 2 discs on each side. 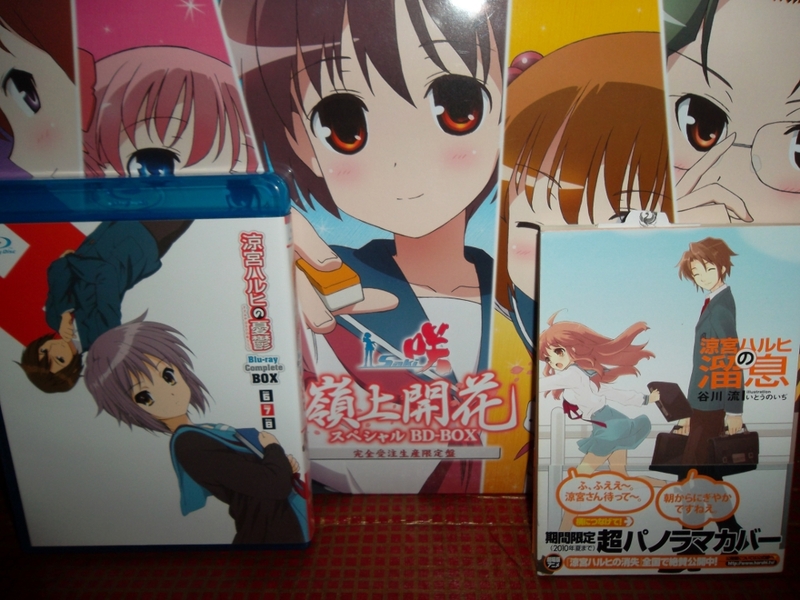 The front cover uses the original key visual and continues into episode and bonus feature listings on the discs. 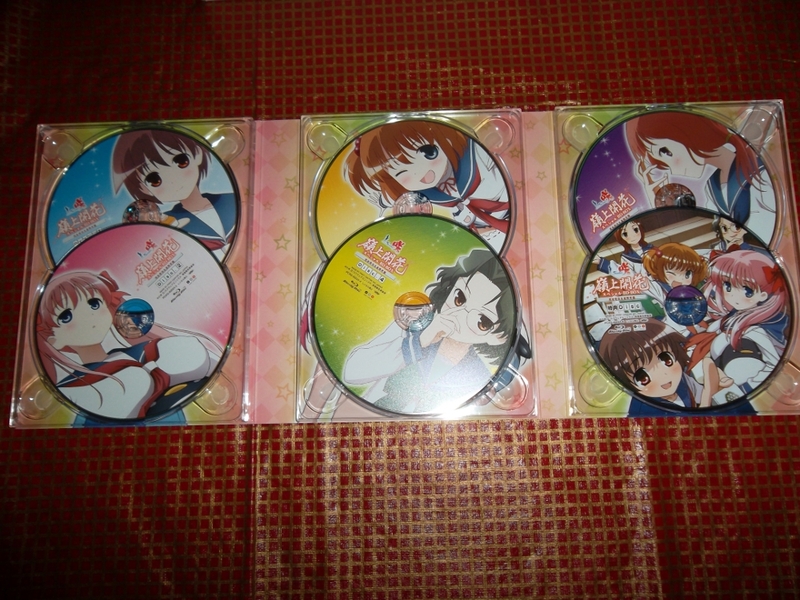 Underneath the discs are images of Saki, Nodoka, and Yuuki wearing swimsuits. I had no inclination of taking a picture for that. 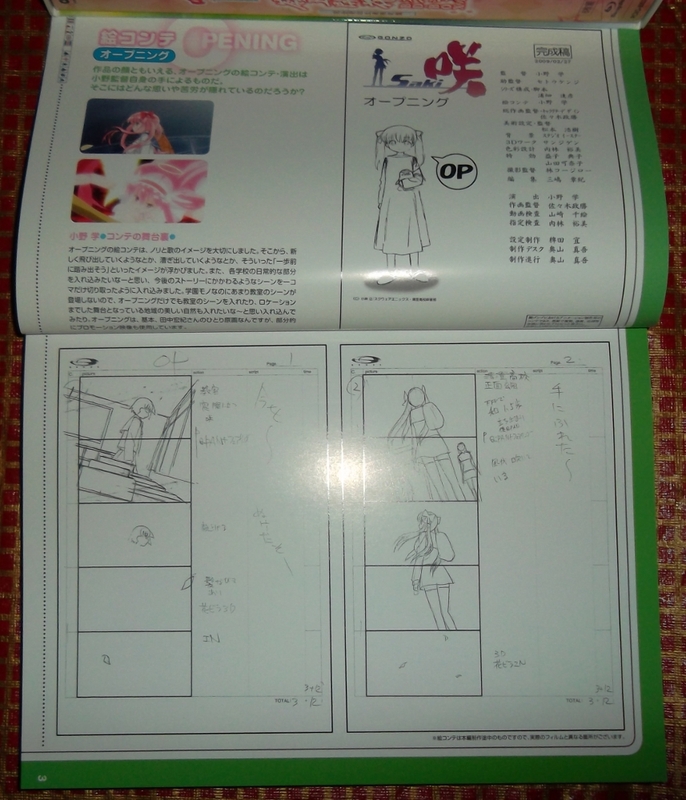 In the 196 page booklet, we start with storyboards for all 2 opening animations and 3 ending animations. Next are the character designs for everyone (and I mean EVERYONE). Following that are some background/production artwork for the various locations seen in the show. 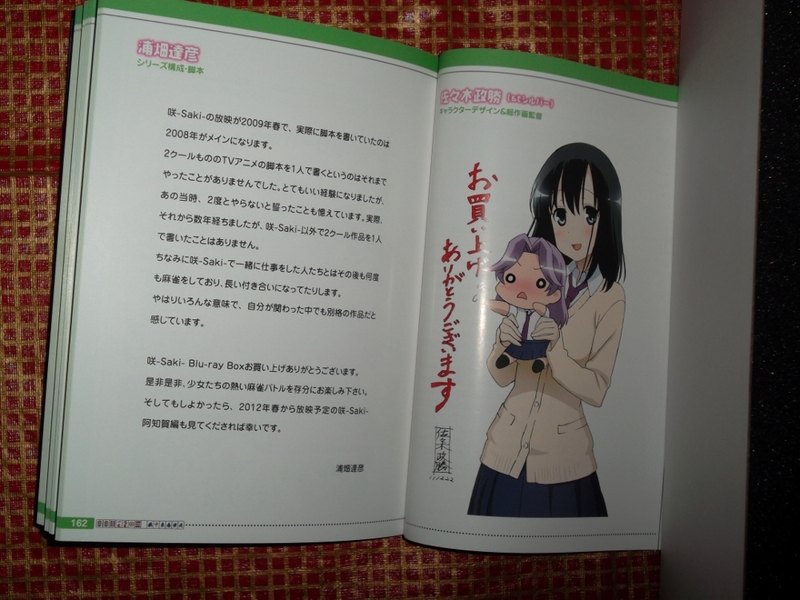 Then there are explanations for the picture drama stories originally included with the 3-9 DVD volumes. We then have some messages from the anime staff members thanking us for supporting the show and some explanations for scenes (along with the tile situations at various points). 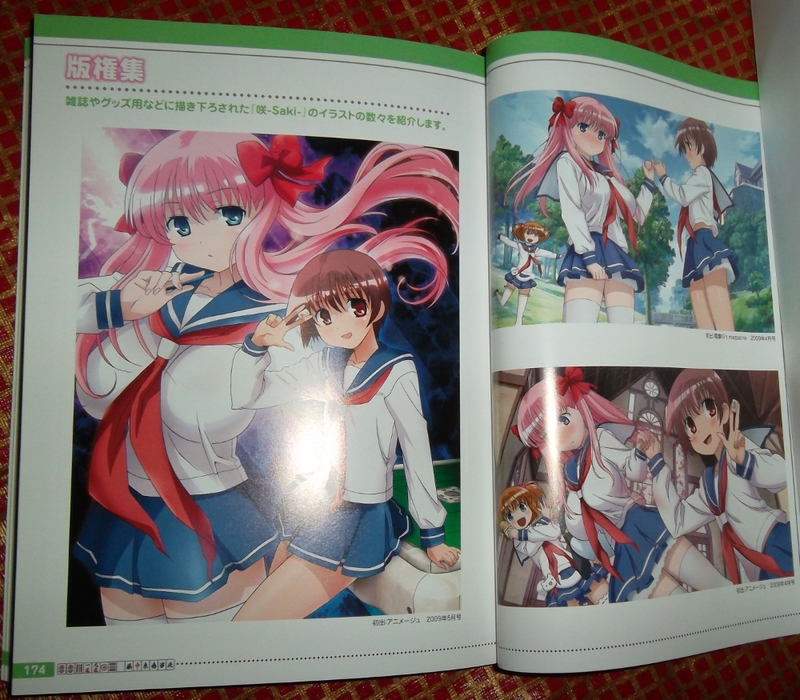 Various pieces of artwork drawn for magazines/goods are also included next and finally the booklet references the bits of information included with each DVD volume (like that the final end card was drawn specifically by the character designer). 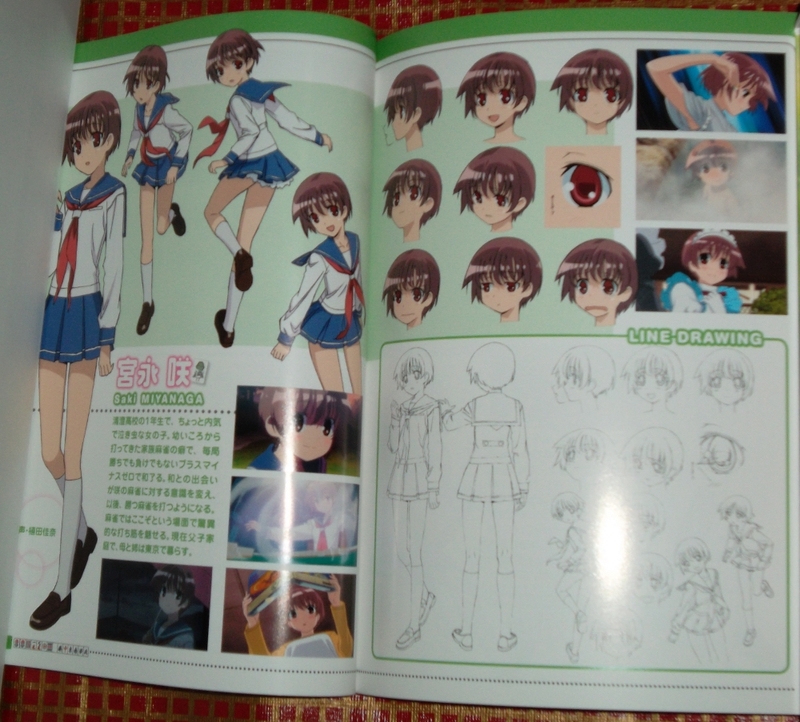 The booklet ends with a look at the original frames that were added at the end of episode 25. But there’s a few things missing in the booklet.. like the DVD covers! 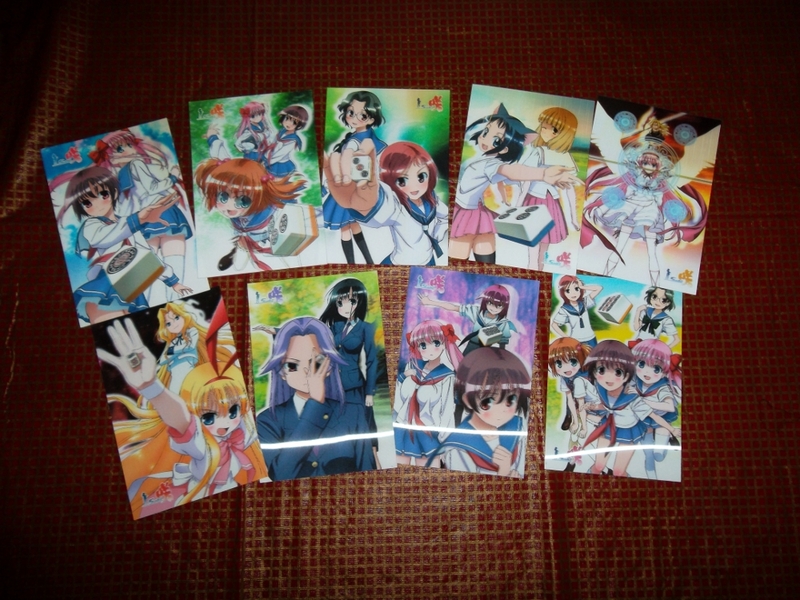 All 9 covers were made into 3D illustrated cards. When you look at them properly, they do appear as if the characters are layered upon each other and the background. But what’s underneath all of those extras? 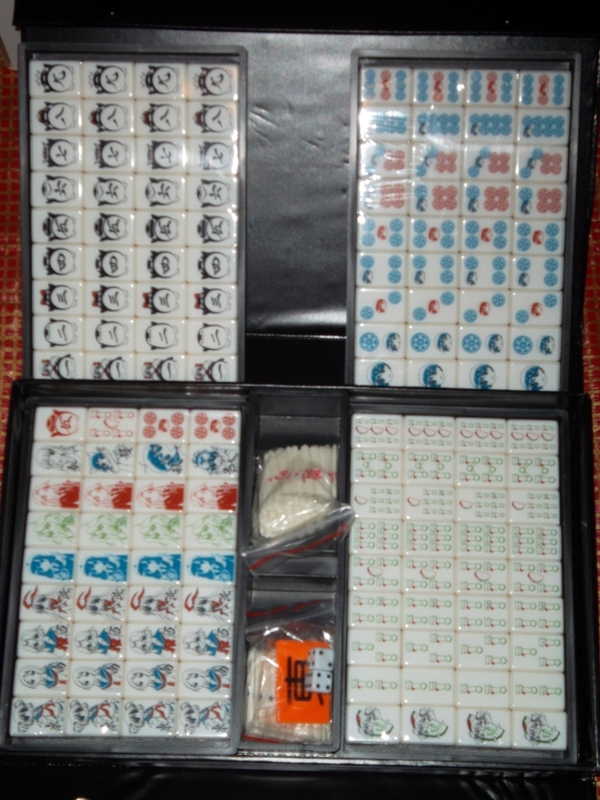 It’s a full mahjong set with sticks and turn marker! 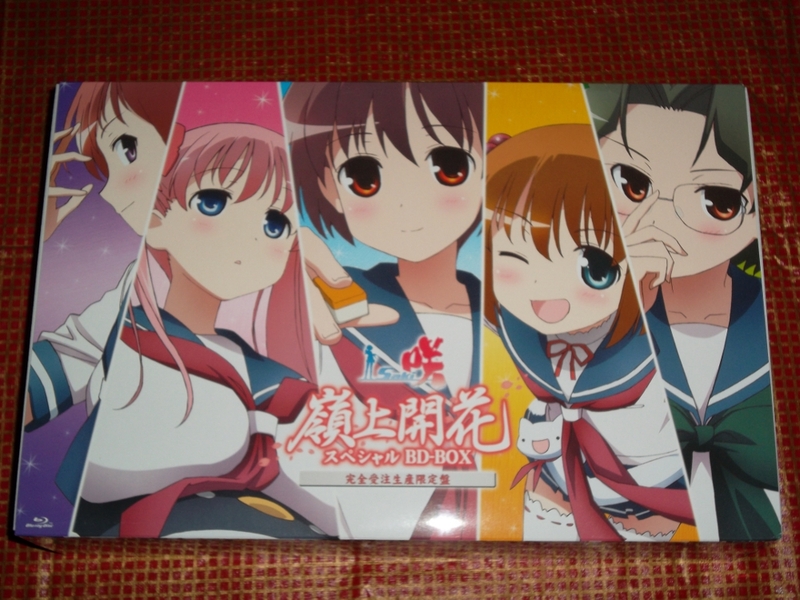 This set was drawn by the character designer Masakatsu Sasaki just for this box. They’re not the highest of quality, but the tiles feel fine to me. Now that we’ve seen all the extras, let’s discuss how the show itself. I’ve mentioned my thoughts on the series prior (tl;dr: it’s a series that emphasizes the fun of the genre while being able to develop multiple characters and plot lines to culminate in the 19th episode. The long wait while the mangaka works on the nationals arc has really angered a lot of the anime-only fans, but this series is worth the wait. I marathoned it in three days originally and enjoyed every moment of it. One of my favorite shows of all time. The show was not animated in high definition, despite airing in 2009. This becomes incredibly apparent when you view the screencaps of this upscale. Q-tec’s new technology, F.O.C.U.S. did what it could, but they went from the DVD masters, which didn’t have the best quality. It’s not the worst upscale I’ve seen, but it’s certainly not one you’ll want to show screencaptures of. I’ve included 16 screencaptures from the first few episodes and the OP/ED for reference. It does look much better in motion though. 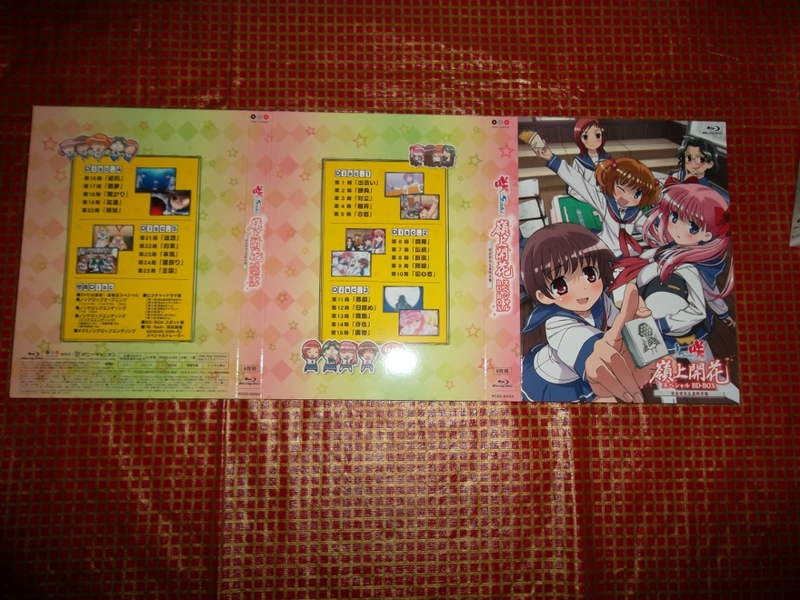 On the bonus features disc, we have a mahjong special included with the LE of the first DVD featuring the main 5 seiyuu, both textless openings, all 3 textless endings (including the three variations of the “serious ending”), TV commercials for the BD-Box, all 7 picture dramas, and a special trailer for the Saki – Achiga Hen – episode of side A anime that begins next month. It’s only an extra 15 seconds with two additional areas, so don’t feel left out by not watching it. 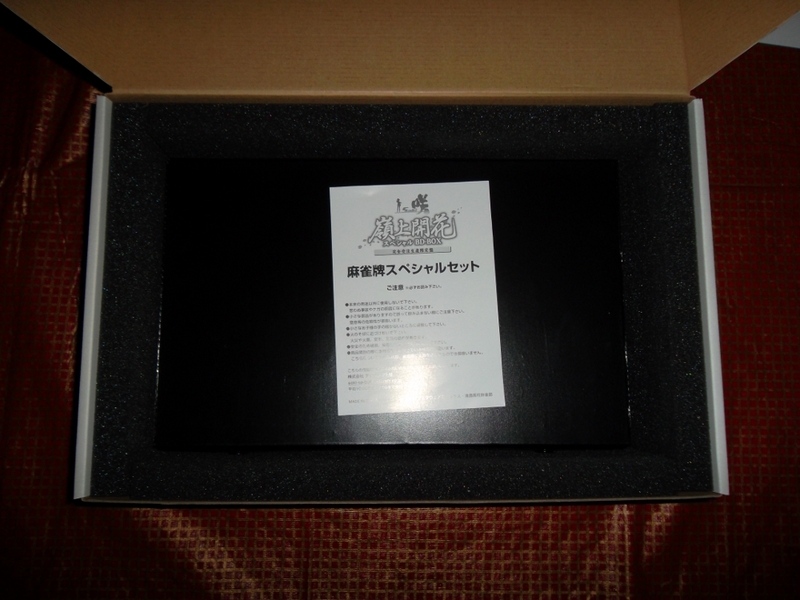 And so that’s the biggest (literally) BD-Box I’ve imported. Could the show have gotten a better upscale? Yes, but I didn’t order it for the visual quality. This set reminds me why I enjoy the franchise: it’s packed with a lot of fun things for everyone! Saki: Mahjong is fun, isn’t it? Last winter, when I had some free time, I decided to continue the KeyAni shows and give Kanon another try. Having abandoned it when I first started to try watching anime in 2007, I wanted to give it a chance. Knowing how sad Key shows tend to be, I wanted something else to lighten up my day and so I saw Saki available on Crunchyroll. 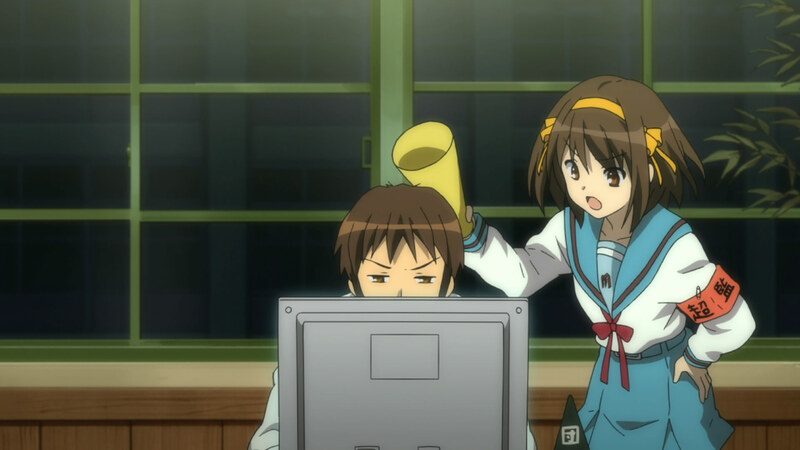 After realizing that I was watching about 3 episodes of Saki for every one of Kanon, I decided to finish the series in one swoop and it’s been one of my go-to shows ever since. I’ve not written about why I like Saki so much, so here is why “mahjong is fun” for me. 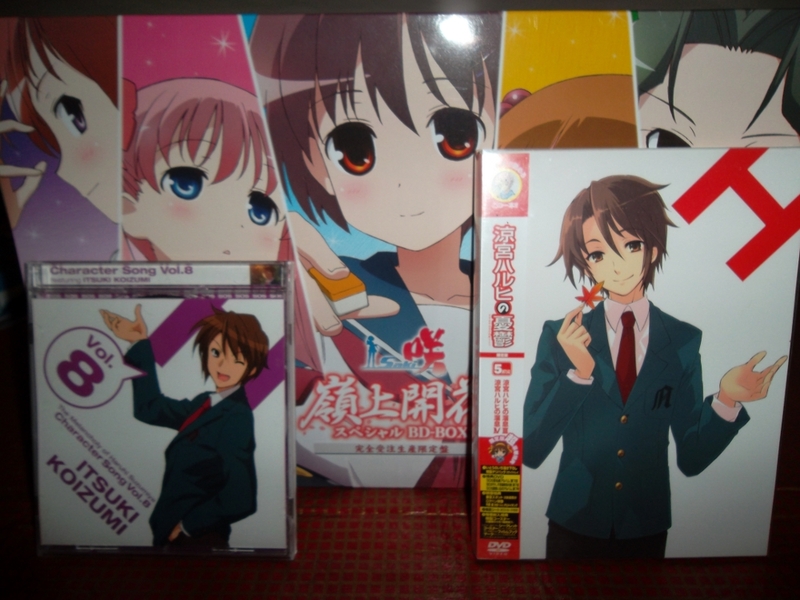 Beginning in June 2006, the Saki manga created by Ritz Kobayashi in Square-Enix’s monthly magazine Young Gangan was adapted into an anime produced by Gonzo in Spring 2009. Late last year I had the opportunity to view it on a whim and immensely enjoyed it. 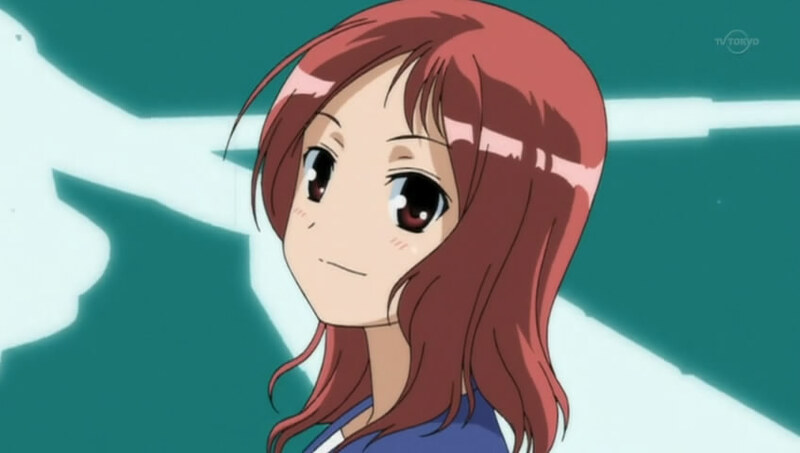 From that series, one character stood alone as my favorite: Hisa Takei.